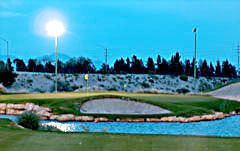 Besides the two championship Mountain and Palms courses at Angel Park - the facility boasts a beautiful 12-hole par three course - with 9 holes lit for night play. 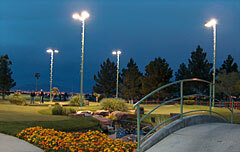 Below are some photos of the Cloud Nine - which is an ideal place to begin a golf vacation in Vegas - perfect for warming up with some iron play, and also great for a night time round. 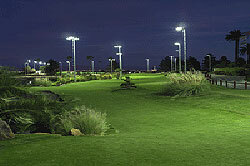 Angel Park also boasts the Practice tee - an expansive grass range that provides lit stations for night practice during the warm summer months. The 7th Heaven Putting Course - one of the only natural grass 18-hole putting courses in the nation - is also lit for night play year round. The clubhouse includes a pro shop stocked with accessories, attire and the latest in golf equipment - and a casual restaurant/lounge with televisions tuned to your favorite sporting events. Banquet and outing facilities are also available. Visit the Angel park web site for more information - by clicking here.